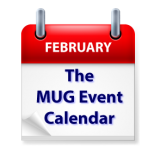 This week’s MUG Event Calendar features a visit by Jason Snell to a California group and a Florida group with a meeting on Apple Networking. USB Microphones and their uses will be examined at a New York group and the Ten Commandments of Apple Troubleshooting will be talked about at another California group. Other topics on this week’s agenda include backing up, end user agreements, cord cutting, iTunes university, Internet safety and more. The Northwest of Us – When to Upgrade?